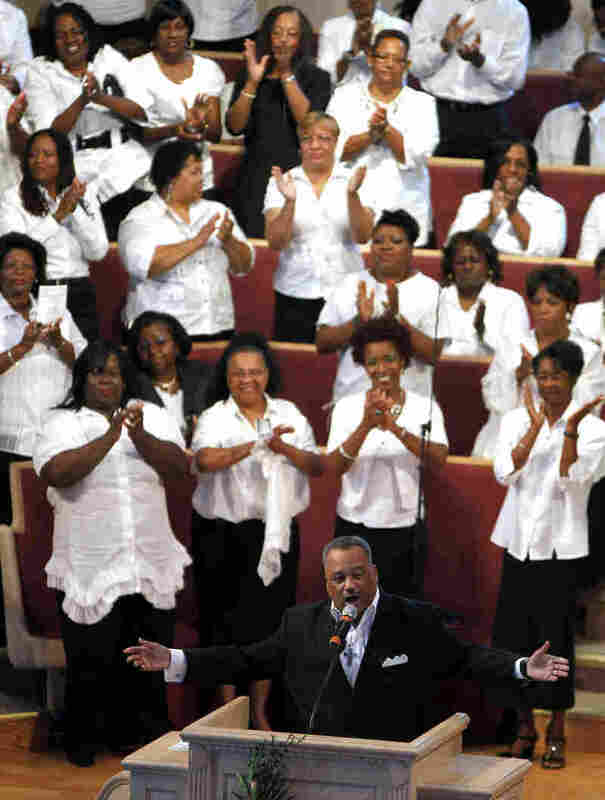 Southern Baptists See Their Future In A Black Pastor The Southern Baptist Convention is expected to elect its first black president on Tuesday: Fred Luter, a former street preacher who turned a dying New Orleans church into a powerhouse. His election is a milestone for the 167-year-old denomination at a time when minorities make up a growing share of a shrinking membership. The Rev. Fred Luter is running unopposed for the presidency of the Southern Baptist Convention. Here, he delivers a sermon during Sunday services at Franklin Avenue Baptist Church in New Orleans. Luter, who is running unopposed for president of the nation's largest Protestant body, is a departure from his predecessors. He was the middle child of a divorced mother, and until a motorcycle accident landed him in the hospital at age 20, he had little interest in God. "I grew up in the 'hood, and my mom worked two or three jobs. So I hung out with a lot of bad guys, did a lot of crazy things I should not have done," Luter said. "And so, when I gave my life to the Lord and saw what God did in my life, then I wanted all those guys I ran the street with to experience what I was experiencing." "It would have been easy for Fred Luter to have said, 'I think God's calling me elsewhere,' " says Russell Moore, dean of the Southern Baptist Theological Seminary in Louisville, Ky. "And he could have gone to a very comfortable pastorate anywhere in the country. "And yet, he stayed," Moore says. "And he stood with the people of New Orleans and said, 'We'll be back, we'll rebuild' — and became a spiritual anchor." Luter's decision to stay, and his personal charisma, propelled him to national prominence in the Southern Baptist Convention, says pastor David Crosby. Crosby leads First Baptist of New Orleans, which shared its space with Luter's congregation while they rebuilt. He adds that Luter brings something else desperately needed to this denomination, which has seen its numbers drop: He understands how to reach the only growth area of religion. "The future of the country is urban; the future of the Southern Baptist Convention is also urban," Crosby says. "We've got to learn how to operate and do our mission and thrive in the urban environment. And Fred brings that. He knows it instinctively." The SBC has made some progress in that area. Two decades ago, the denomination was "as white as a tractor pull," as one critic put it. Now it's 20 percent minority. Richard Land, who heads the SBC's Ethics and Religious Liberty Commission, says Luter's election shows how far the Southern Baptists have come from the days when they supported slavery. "It's as historic a moment as Southern Baptists have had," Land says, "because the president of SBC is not just an honorific — it is a position of real power." "This is a great job, but it's somewhat symbolic and ceremonial," he says. Some say there's a latent racism in the denomination. And many were troubled by a recent broadcast on Land's radio program in which he said President Obama and black leaders were using the death of Trayvon Martin for political purposes. "This is being done to try to gin up the black vote for an African-American president who is in deep, deep, deep trouble for re-election," Land said on the air. "It was like someone took a knife and stuck it in my heart," McKissic says. "It validated suspicions that many black Baptists have had all along, that this is how a good number, if not the majority, of Southern Baptists felt." "I don't want anything I've said, or any mistakes I've made, to detract from — in any way — from what is going to be a truly historic moment — a historic moment in which I rejoice," he says. Luter has forgiven Land; he says it's time to look forward. He notes that if he's elected, it will be because white Baptists voted for him. "It won't be because of the handful of black folk that's going to be there," Luter says. "So, it will say something to the country and to the world — that the Southern Baptist Convention is not just talking this thing, we're actually walking this thing."